Samples taken from 250 sites along the Amazon—the first systematic analysis of the region's well water—also revealed hazardous levels of manganese and aluminium, they reported at a conference in Vienna. "Faced with polluted rivers, many rural communities rely on groundwater as a source of drinking water," lead researcher Caroline de Meyer, a scientist at the Swiss Federal Institute of Aquatic Science and Technology, told AFP. "In parts of the Amazon basin, groundwater contains these trace elements in concentrations that are potentially harmful to human health." "Contamination should not be underestimated—all our data point in the same direction," she added. Levels of manganese were up to 15 times higher than World Health Organization (WHO) limits, while aluminium exceeded WHO standards by up to three-fold. The elements detected occur naturally, and do not come from industrial pollution, the researchers said. Chronic exposure to arsenic is linked to cancers of the liver, kidney and bladder, as well as heart disease. It is also thought to contribute to miscarriages, low birth weights and poor cognitive development in children. In Bangladesh, where arsenic in well water has been a known health hazard for decades, the element is blamed for some 40,000 premature deaths each year. Manganese poisoning can cause permanent neurological damage, while the impacts of sustained exposure to aluminium are less well understood. Rural communities in the Amazon basin traditionally rely on rivers and rain to meet freshwater needs. But with increased pollution from mining, logging and industrial activities, they have also turned to digging wells. "We sampled wells that are more than 20 years old, and some that were only a couple of weeks old," de Meyer said ahead of a press event Tuesday at the annual meeting of the European Geosciences Union. 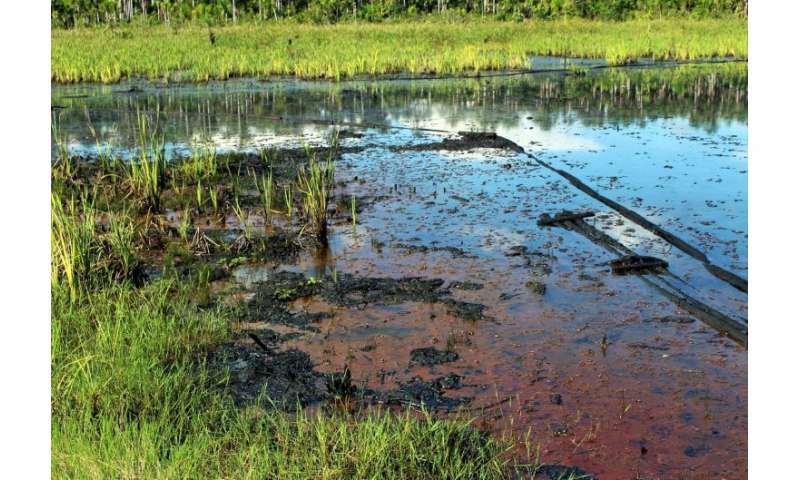 The field work, carried out with researchers from Peru and Brazil, focused on measuring chemical concentrations and did not examine health impacts. "At this time, we cannot say how many people are affected," de Meyer said. Much more data is needed to identify "hotspots" where levels of toxicity are especially high, and areas that rely heavily on wells for drinking water, she said. Unsurprisingly, awareness of the problem remains very low in the region. By a chemical quirk of fate, the degree of poisoning has probably been blunted by the fact that water contaminated with arsenic also often contains iron. Because iron causes water to turn reddish-brown, people often let it stand so that particles—including some of the arsenic—can settle to the bottom. De Meyer first uncovered dangerous levels of arsenic in groundwater drawn for drinking at a couple of sites in the Peruvian Amazon, leading her to suspect the problem was more widespread. The new findings are preliminary, and will be fleshed out in a peer-reviewed publication, probably later this year, de Meyer said. The Amazon basin, drained by the Amazon River and its tributaries, covers some 7,500,000 square kilometres (2,900,000 square miles) and is spread across eight countries.